A package version is a fixed snapshot of the package contents and related metadata. The package version lets you manage changes and track what’s different each time you release or deploy a specific set of changes. When clicking for the first time on Generate New Version in the Unlocked Artifact record, the following warning will be displayed “You need to create a package first to be able to generate beta version”. Still while viewing the Generate New Version screen, click on Generate Package to generate the Unlocked Package for the first time. Once the package is generated successfully, click again on Generate New Version to create a new version of the package. Previous Release Version: read only field to inform previous release version of the artifact. New Version Name: new name for the version of the package. Installation Key: an option parameter to have an installation key for a key-protected package. If empty the installationkeybypass parameter will be automatically set to true. Click on Generate Beta version to create a new version of the package that can can installed. Note you can’t install beta packages in a production org. This is a safeguard to make sure the package version you release is production ready. When you know that a version is ready for the world, you can promote the package version to released. For the package to be ready to be installed in Production Orgs, is needed to promote it to Released Version. The Latest Package Version field on the Unlocked Package record is auto-populated upon new version creation. Notice that there is also a related list of all the package versions. To begin with, locate the Artifact Version record in Beta and open the record. 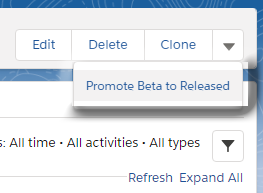 Click on Promote Beta to Release. You will see a screen with a short summary of the definition file. After promoting the package, the Artifact Version record will be automatically flagged as Is Released.